The initial idea by Andrea Knobloch will not be realised due to budgetary constraints, as well as to structural and conceptual considerations. In the "playing-field" that is Berlin-Neukölln, art is played out in two variations: the representative outdoor sculpture (demonstrating stately/private power) and the social-cultural art project (demonstrating stately/private impotence). Exhibition in the public space - which attempts to achieve a legal status and at the same time be well-received in an art context - can only be realised with the help of local administration. But these projects also serve to demonstrate the more-or-less obvious power structures of the appearance and function of the city space. These exhibition plans primarily produce a temporary conspiracy between the organizers, the artists and the regulating institutions. The resulting temporary "occupation" of the urban area through art projects can be seen as strategies of privatisation. Existing uses of urban areas - and everyday social performances - are appropriated as artistic "material", thus ignoring or expounding the problem. Carrying out an art project on public terrain can hardly be based on a critique of the privatisation of public space, since after all it is also importing its own art concerns. In this way, art becomes a representative of authoritarian regulation and individual utilisation interests, therefore translating the public space into an exclusive "presentation area", adding further usage regulations to the existing space. stadtraum.org focuses on "art in the social urban context". It questions the specific qualities and characteristics of the so-called "public" space as well as the positions that art is able to take over. It also questions the meaning that is formed through art, and the demands and expectations, which are imposed upon art by the urban society. In the context of 'Okkupation' we will visit and explore the urban space of Neukölln concerning the abovementioned matters. Enhancing, decorating, entertaining, disciplining, and remembering/reminding are the main duties of art in the city. It is the aim of our project to open up an urban platform of communication on arts initially neglecting such concerns. The visible manifestation of the search for the "site" of art in the urban-social context of Neukölln will be the stadtraum.mobil. 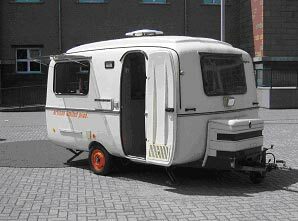 This is a caravan, which moves through neighbourhoods as a travelling sculpture, making temporary stops at selected locations. The route through the area will not be planned. Instead, it will develop from conversations with city-users, who will be asked about potential art sites in the area. Setting out from a central point, we will orient ourselves according to the given recommendations. Assuming the role of interested tourists during our stay, we will produce our comment on art in Neukölln that can also be read as a navigation of the urban space. At the conclusion of our "tour", we will shift away from the distanced perspective of the passing visitor to that of insider: A guided tour through Neukölln's art sites based on the aforementioned route will be offered to the interested public. With this project we will reflect on the concept of the exhibition of art in the public space, by reordering and reusing the format of action stereotype. Under our guidance the artistic intervention itself will be put aside. Instead, the scouting of the city - which is necessary to seek departure points for the production of publicly conditioned "picturesque" art - will be set into the exhibition period. Enhancing, decorating, entertaining, disciplining and remembering/reminding become secondary. Instead, the focus of interest will be the positioning of art in the social urban context.